Today’s post is the second Guest written by Santa Claus himself. He’s made his list, and checked it twice. Let’s find out who’s been Nice. Yesterday I stopped by to share my Naughty list. Today I’m here to offer up my Nice List. Before I do I want to take a moment and remind all you good little boys and girls to not become bad next year. The year wasn’t all bad; I know Dasher and Dancer, Donner and Blitzen all had their best performance review yet this quarter. 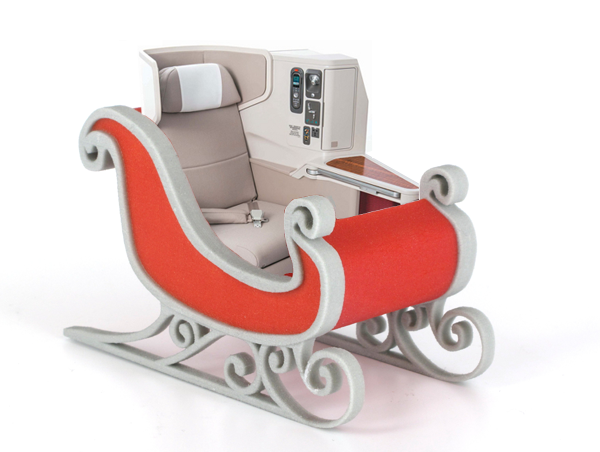 And as I mentioned yesterday, my Sleigh’s new Lie-Flat seat has been a great addition to the TDT (Toy-Delevery-Tech). 10. Amazon Payments. My *ahem* personal issues with Amazon aside, AP has gotten all of us out of at least one jam. It will be a sad day when we finally have a debriefing for this one. Losing AP would be like losing an old friend. Probably doesn’t deserve to be on this list as many better options have come and gone, but I’m nostalgic, and so it slips in at #10. 9. Citibank Churnable AA applications. For a brief while these were able to be churned over and over. This was a huge windfall for some, and with so little effort, deserve to be on the nice list for sure. 8. American Express Sync Deals. They weren’t on their own great Mile-makers, but teaming them up with other deals allowed for some significant Miles and money to be made, without expense or too much hassle. 7. Chase Gift Cards. For about 5 months these were available for no fee and at a limit of $2600 per month per Chase card. Some went nuts and saw AA (Adverse Action)/Account closures. Others took this for what it was; an extremely easy, nearly free way to hit minimum spending on any new Chase card. And for those of us with tons of Chase cards this turned out a nice number of miles/UR. 6. 150,000 Membership rewards in two pulls. www.travel-summary.com broke the news in January about a 100k Platinum and a 50k PRG offer. (Great blog too, if you don’t read it you should). Santa loves using MR for Avios redemptions on AA and Alaska (my #1 carrier) so these two apps really juiced my stash of MR.
5. Citibank 5x Gas Groceries and Drugstores. Most of you are just about finishing your 1 year with this card. Being 1700 years old I spent a ton at Drugstores this year, and the 5x really paid off when it came time to pay off the mortgage on the old North Pole house. 4. Making Money and Miles from Grocery Stores. This one is sort of regional, so we’ll cap it at #4. There aren’t any Safeway or Albertsons at the North Pole so I didn’t get to take advantage of these, but Sam told me that from Summer to Winter there were offers aplenty. Keeping Cost Per Mile down was greatly helped with these promos. 3. CVS Goes to $5k per day. It isn’t often you get an increase like this, so take it as a piece of Holiday cheer. Sure some stores don’t follow, and a DL scan is annoying to some–but $5k per day can seriously drive down your carrying costs, especially for travel. The only issue is you’re dealing with Incomm who are #3 on the naughty list. 1. Prepaid Cards get PIN (and Debit features). Argue with the rest of this list but agree with this one. A Federal Reserve ruling on the DF financial reform bill opened up the possibilities for Prepaid cards. Doing so changed the game this year. Without this ruling I hate to think of what 2013 would have looked like. That’s the list Folks! I’d stay around for comments, but as I said I have a lot to do. I hope that 2014 is even better for Miles for all of you! Until next year, Be good to your miles, and your money!